What: There’s no food theme for this meeting. 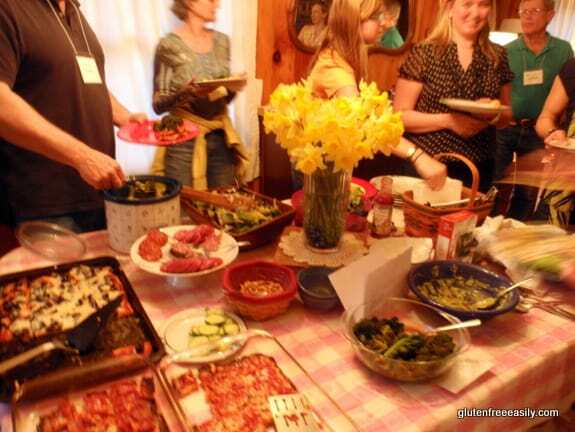 If you’re new to the group and uncertain of what to bring that would be gluten free and safe, the following are always needed and welcome until you feel comfortable bringing gluten-free dishes: simple beverages (e.g., Limeade, Lemonade), napkins, and bottled water. Without having any presentations lately, our meetings have been mostly our dinner affair and opportunities before, during, and after dinner for one-on-one conversations. That has been a nice change of pace and beneficial to all I believe. With warmer weather just around the corner, we’ll try to get a few presentations on the agenda to make things a bit more interesting. I mentioned the following topic at our last meeting, but would like additional info if you have a moment. Brooke from Triple Oak Bakery in Sperryville, which is 100% gluten free, has asked for your input. She would like to know how many of you have an interest in her offering her baked goods in the Fredericksburg area. She’s looking into providing baked goods at the farmers market in Fredericksburg and offering her baked goods at some locations in town. Some of you might recall Brooke from her presentation and cooking demo to our group a few years ago. She made blueberry scones for us and brought even more treats with her. They were all excellent! Would you please reply to Brooke at [email protected] if you’d like her to bring her gluten-free treats to Fredericksburg?